Eartheart Center Mountain Sanctuary offers training programs (workshops, internships, and nature camps) in primitive earthskills and natural living, as well as mentoring in permaculture, earth based spirituality, holistic healing and other crafts. Visit ccarrstarr@blogspot.com for more information about Eartheart Center. of heart, mind, body and spirit. To model a sustainable integrated lifestyle while living in harmony with nature. Primitive earth skills such as foraging, flint knapping, hide tanning and shelter building. Sustainable homestead practices such as organic gardening and edible landscaping. Arts and crafts (such as creative writing, wood carving, basket making, weaving, pottery making. Holistic healing and nutrition, such as wild and raw foods, clay therapies, hydrotherapies, exercise and body work. Eartheart Center is a Sanctuary cradled in the heart of the Smoky Mountains near Cherokee, North Carolina. 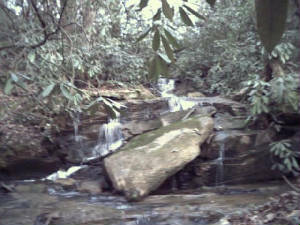 Blessed with a sparkling mountain creek, waterfalls, bottomland, and ridge top views, this verdant, lush, womb-like environment can nourish your relationship with nature as well as renew your own nature. Here you may learn many practical skills practiced by indigenous peoples that re-establish your appreciation and connection with the earth. By appreciating the beauty and practicality of our natural world, we hope to balance and nurture ourselves spiritually. 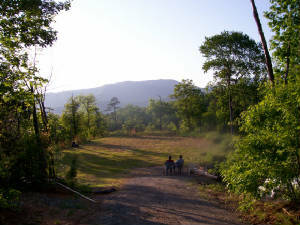 At Eartheart, the creation of an educational and spiritual center is supported at several levels: acquiring practical earth-skills for living sustainably with nature; appreciating the earth as a sacred sanctuary; recognizing nature as a reflection of our own soul; and rediscovering a sense of community arising from spirit-centered collaboration. Our intent is to create a harmonious way of living and being by remembering our wholeness. This involves reunification with both mother nature and our own nature, balancing and integrating all aspects of ourselves into oneness. Through communion with the earth, we become grounded in our spiritual center. Soul is inside us and all around us. Our renewed appreciation of the natural world aids us in healing, remembering and balancing of our inner world. In turn, this corresponds with the healing and renewal of our outer world. We provide this sanctuary for communion with nature and for practicing earth skills, as well as for participating in earth centered ceremony, healing, meditation, and contemplation. Currently our facilities include bathrooms, space for workshops, and primitive camping. Plans for expansion include the the creation of a primitive earth-skills village and the addition of small retreat cabins. We invite healers, teachers, networkers, and others to share their skills, talents, healing modalities, and inspiration. We offer a sanctuary to work and play together in healing, renewal, balancing and empowering one another and the land. We invite your participation in the development of Earthskills at Eartheart. For more information, view ccarrstarr.blogspot.com. To become part of our spiritual and educational center in the Great Smoky Mountains or to plan a visit,email ccarrstarr@gmail.com. An important component of our Earth Skills Program will be a primitive village away from the distractions of modern everyday life. This living history village will consist of both Cherokee and pioneer style log cabins as well as bark lodges and wigwams. Among these structures, reconstructed from local and natural materials, both Cherokee and Appalachian pioneer life skills are to be demonstrated. For programs lasting a few days or up to several weeks, folks will live, eat, work and play in this uniquely authentic setting, with opportunities to reconnect with nature, create a live-in community, experience native culture, learn survival and pioneer skills and practice indigenous arts and crafts. Our staff shall include crafts people, earth skill instructors, counselors, mentors and ministers. They role model for participants an earth-centered awareness by sharing games, storytelling, ritual, survival skills, foraging and gardening, as well as earth-skills and crafts such as basketry, hide tanning, woodcarving and blacksmithing. All such hands on activities involve communion with natural elements. Through experiential learning participants gain appreciation and understanding of relationships and forces in nature. We teach participants about interconnectedness of life, attune them to nature and impart a deep appreciation for the earth as a living being with inherent beauty, purpose and design. For youth groups and adults alike, we provide a multicultural experience close to nature. For historians and Native American cultural enthusiasts, we provide hands on experiential learning. For students of wilderness skills, we apply woods crafts, foraging and earth skills in the context of daily living situations. For those seeking to reconnect with nature, we provide a natural sanctuary in which to relax, re-balance and remember our Oneness with the Universe away from contemporary hectic work and life styles. Our village also provides a kind of encounter group therapy, where participants learn how to work together to create a community. Leaving the twentieth century behind enables participants to discard previous prejudices, coping mechanisms and learned behaviors, opening the mind to personal insight and psychological breakthrough. Through improvisational role play, participants can shed their old cloak of personality and reshape a new one. The sheltered supportive community of the village can empower individuals to experiment and re create themselves and their world. The emotional receptiveness and vulnerability created when having to release one’s previous reality and adapt to a new cultural and environmental context, may be especially helpful to therapists working with special populations, such as adults in crisis or adjudicated youth. In contrast to our instant gratification culture, applied hands on learning of new skills, crafts and participation in drama play stimulates the creative imagination of participants. New kinds of responsiveness will develop. Skills learned in the village will stretch the capabilities of each person to help them discover inner strengths and resources in the context of a safe and nurturing environment. Teamwork, developing trust, respect, cooperation and interdependence will be emphasized. We provide opportunities for self discovery, the quest for personal mythic mission, to redefine one’s purpose in life. Our goal is to co-create an experience so valuable and penetrating that it causes one to ask fundamental questions about mankind’s place in the environment, our personal relationship with the natural world, and our identity within a social context. Our concept for a working primitive village is fashioned after the Gaia principle. The Gaia theory (Lovelock and Epton, 1975) is a scientifically based synthesis of both geological/geographical research and aboriginal wisdom concerning the nature of planet Earth, hypothesizing the earth to be a living, self regulating organism. As participants work with nature and begin to appreciate more and more her beautiful cooperative and interdependent qualities, the earth is directly known to be alive and sacred. Our vision is to act as midwife in birthing a holistic spiritual consciousness, assisting individuals through emotional transition toward inner self awareness and outer harmony with the natural world. It is our hope that such experiences in our living history village will become a rite of passage for participants into a more holistic planetary awareness. Jeff Gottlieb has been a professional interpretive naturalist since 1980, and focused on teaching primitive living skills, wilderness survival, and living history since 1987. He's effectively taught these skills to thousands of people and with several environmental education organizations, including Earthskills Rendezvous. (visithttp://www.primitiveskills.org/earthskills-rendezvous-staff-instructors) He has built over 40 authentic wigwams and longhouses all over the Eastern U.S.